Old moucharabieh khidki frame in teak. Very nice old frame, teak. 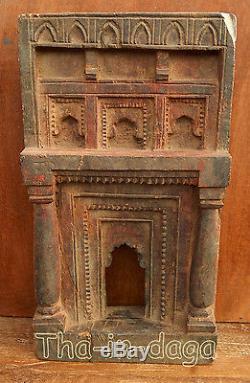 This object was used, at the time, as an object of decoration placed at the top of the walls inside the Indian houses. Indeed, to create aeration, the builders pierced some walls of the house from side to side to let air circulate. On the outside, passers-by perceived only a hole in the wall; inside, these frames inserted in the wall were the deco of the house ..
the item "old teak frame moucharabieh sculpte xxl 5,1kg 25x46x8,5cm india" is on sale since Monday, November 20, 2017. It is in the category "art, antiquities \ objects of the nineteenth and before". The seller is "tha-in-daga" and is located in / in paris. This item can be delivered anywhere in the world.